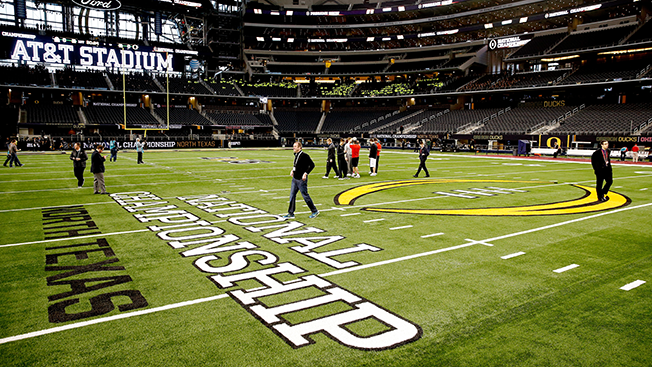 If you're tuning in to the College Football Championship game between University of Oregon and Ohio State tonight, ESPN wants to give you some options. For the second year, the network is offering "Megacast," a collection of 12 ways to watch the game across its platforms. "It's an opportunity to experiment and appeal to fans who want to consume a game in multiple ways on multiple screens," said Ilan Ben-Hanan, ESPN vp of programming and acquisitions. Ben-Hanan said ESPN will show the same ads across all of its linear networks, but its Megacast allows it to try additional content while still combining all of its broadcast audiences for a total viewership number. Theoretically, fans will be able to tune in to the main broadcast, but can also watch the alternate broadcasts on their other devices, creating a cross-screen experience. "We're seeing more and more evidence that when fans sit down to watch TV, they have their mobile device, tablet, and are on social media. The most engaged fans, they're watching the game and injecting their own opinion in it. We embrace that," he said. The network doesn't plan on Megacasting all sports events, but it was pleased with the success of last year's broadcast, so it decided to bring it back this year. A total of 26 million people watched a version of last year's game on ESPN, ESPN2 and ESPNEWS, with another 773,000 unique viewers catching it via the WatchESPN platform. It was the third-largest audience in cable television history. For example, in additional to the traditional telecast led by Chris Fowler and Kirk Herbstreit this year, ESPN will also provide the Film Room on ESPN2, where analysts Chris Spielman and Tom Luginbill will offer commentary in real time on the game alongside Mississippi State coach Dan Mullen, new University of Pittsburgh head coach Pat Narduzzi and University of Nebraska head coach Mike Riley. Fans can also check out the Taco Bell Student Section on ESPN 3, a broadcast of the Taco Bell-sponsored V.I.P. areas where people are enthusiastically watching the game. While this does give fans more options to finally find a commentator with whom they agree, Ben-Hanan insists that ESPN primarily wanted to find alternate viewpoints. For example, it tapped Narduzzi because he was the former defensive coordinator for Michigan State, which was the only school to play both Oregon and Ohio this year. "This in no way takes away from the traditional telecast," Ben-Hanan said. "It's meant to be additive and expanding."